Kefalonia Katavothres: On Kefalonia island, there is a place that one should not miss visiting. This is one of the world's most astonishing geological phenomena for which there have been many discussions. 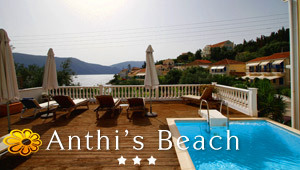 Katavothresis not difficult to reach, as it takes only 3 kilometers from Argostoli long the Fanari road. The sea water rushes in through some cracks in the rocks on the shore and vanishes underground. In 1835, the phenomenon was rare enough that the English built some corn mills and while earthquakes broke the water wheel amazingly nothing happened to alter this trend of water coming in and going under. One could well ask where the wheel was set up so as to work. They needed flowing water. This is where the rare geological formations came in to play. At Katavothres the sea flows inland and enters sinkholes on the earth that is below sea level. It is assumed that there are caverns below the seabed which is where the water flows in. The mills used to be run in these holes. The water would flow swiftly through the artificial channels and the wheel would start spinning. In 1963, Austrian geomorphologists added some purple dye to the water and followed its course only to make some surprising discoveries. It traveled in underground rivers then mixed with rainwater and finally reached the Melissani Lake almost fifteen kilometers away in its semi-salted form. From there the water flowed into the sea at the village of Karavomilos, and all in all, it had taken the purple water two weeks to make this trip across the island. There is a cave in Melissani and this cave has lost its roof over a period of time to the severe earthquakes that have occurred. Now a lake has formed there which we know as the Melissani Lake and at the deepest point, it is thirty-two meters deep. The lake has clear blue-green water and the shades change throughout the day. Now the purple dye experiment revealed that the water that disappeared at Katavothres in Argostoli came out at the village of Karavomilos, and went on to form an almost circular freshwater lake, which then empties into the sea at Sami bay. The seawater is continuously falling into these sinkholes only to disappear. One theory as to where the water might go is the theory propounded by Mousson. According to him the source of the movement was attributed to volcanic activity underground that heats the water. Since warm water has a lower specific weight and bigger volume than cold water, it would move up to the surface and this could explain the disappearance. But since there were no thermal springs in this area, these theories had some anomalies. There are a lot of other theories that have been circulated since but none can be unquestionably substantiated. A good idea is to go to Katavothres, enjoy the amazing sites and leave the questions as those known only to nature. There are a quaint village and a small shingle beach where one can relax and enjoy the earth's gift to mankind.